Hey guys! As you know, summer is coming to an end and back-to-school time is coming up quick. I am so sad because I had such a fun summer, but I decided to think of a way to make going back to school a bit easier and more bearable. So, I want to share an awesome dinner recipe that you can make during the week, that then turns into to 2 different lunches the next day! Not only does this make it easier on you, but this way you can prep your lunches the night before, and you won’t have to wake up early on a school day to make your lunch. The recipe that begins as a dinner is my Cilantro Lime Mango Chicken Salad. This salad is hearty, sweet, tangy, spicy, fresh and super filling. It is topped with tons of fresh ingredients like avocados, cilantro and my personal favorite, mangoes! The mangoes add an awesome sweetness to the salad which is the key. I want to thank the National Mango Board for sending me some amazing mangoes that were absolutely perfect in this dish. When you are making this dish, prep a few extra ingredients so that you can transform your dinner into a new dish for lunch the next day! For lunch the next day you have two choices. The first one is my favorite…the Mason Jar Salad. This is a super fun way to “plate” any salad because it displays all your ingredients and it’s so convenient to take to school. 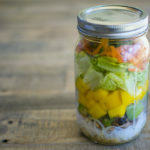 Make sure when you are layering your ingredients, you keep the dressing at the bottom of the jar, and your more tender ingredients, such as lettuce, on top so they don’t get soggy. Once you get to school all you have to do is mix it up and eat it straight out of the jar! It’s so easy! All your friends are going to be so impressed by this lunch because not only is it delicious, it’s GORGEOUS! The second option is my sister’s favorite… SPRING ROLLS! Yes, we had to include some finger food. These spring rolls are fresh, delicious and super fun to make. Just roll up your salad ingredients and pack a side of the salad dressing. It serves as a killer dipping sauce! My sister loves making spring rolls because she can pick and choose her favorite ingredients to add in, and they are a blast to assemble. 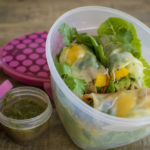 Whether you make the main salad, the mason jar salad, the spring rolls, or all of them, I really hope they will make the back-to-school process a bit more enjoyable. I always find that when I have cool, delicious lunch recipes that I can bring to school, I get a lot more excited. Let me know what you guys think, and if you’d like me to do more school lunch videos like this! Again, a huge thank you to the National Mango Board for sending me the box of perfect, ripe and delicious mangoes for these recipes. If you guys want to learn more tips and tricks on mangoes and different recipes that you can use them in, head to mango.org. I also made a Mango 101 video on how to choose and cut mangos and turn it into an amazing mango sorbet recipe! Check it out! The post with the Mango Raspberry Coconut Sorbet is here. 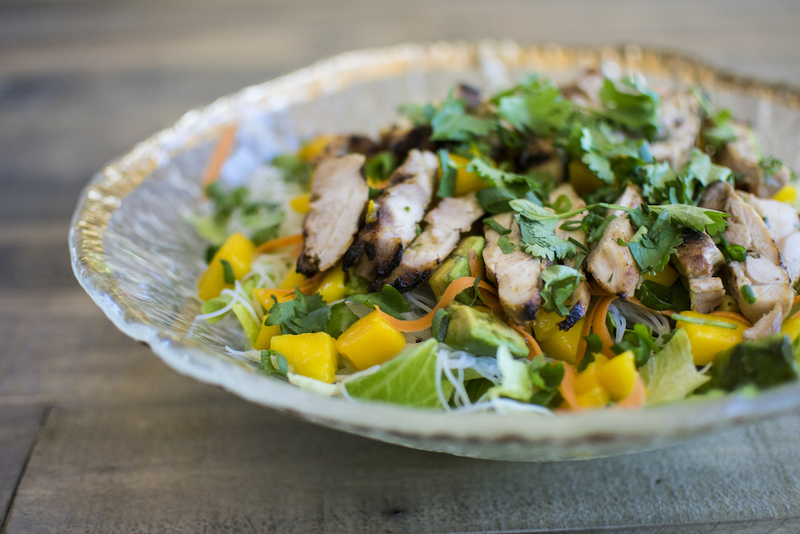 Here is the recipe for the Cilantro Mango Chicken Salad. If you want to use leftovers for the mason jar salad or spring rolls, be sure to make extra! My Cilantro Lime Mango Chicken Salad is hearty, sweet, tangy, spicy, fresh and super filling. It is topped with tons of fresh ingredients like avocados, cilantro and my personal favorite, mangoes! The mangoes add an awesome sweetness to the salad which is the key. 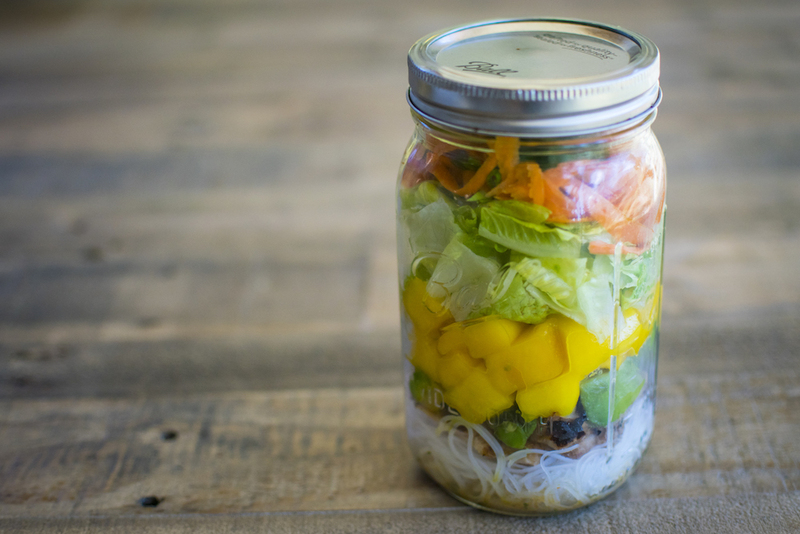 If you want to use leftovers for the mason jar salad or spring rolls, be sure to make extra! Mix all the dressing ingredients together in a bowl or shake them up in a mason jar. Place in the refrigerator until you are ready to dress your salad. Fill a zip lock bag with your chicken thighs and add in a third of your dressing/marinade. Put your chicken in the fridge and marinate for a few hours or over-night. Heat up your grill to medium high heat, and add your chicken. Cook for about 5 minutes on each side or until the thickest part of the meat and it reads about 165 degrees with a meat thermometer. Place your chicken on a plate and tent it with foil and let it rest. In a big bowl add your lettuce, then noodles, and top with avocado, mango and cilantro. Slice up your chicken and place on your salad. Pour over your leftover dressing and toss to coat. 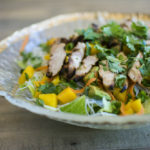 My Cilantro Lime Mango Chicken Salad is hearty, sweet, tangy, spicy, fresh and super filling. It is topped with tons of fresh ingredients like avocados, cilantro and my personal favorite, mangoes! The mangoes add an awesome sweetness to the salad which is the key. If you make the Cilantro Mango Chicken & Avocado Salad for dinner, just make extra to make these salads the next day. If you're starting from scratch, here's the complete recipe. This will make about 2 large mason jar salads. Mix all the dressing ingredients together in a bowl or shake them up in a mason jar. Fill a zip lock bag with your chicken thighs and add in a third of your dressing/marinade. Put your chicken in the fridge and marinate for a few hours or overnight. Heat up your grill to medium high heat, and add your chicken on. Cook for about 5 minutes on each side or until the thickest part of the meat and it reads about 165 degrees with a meat thermometer. The add in your noodles in a layer. Continue adding your ingredients in layers, making sure that the firmer ingredients are at the bottom and more tender ingredients, such as lettuce, on top. That way, nothing gets soggy. Once you are done layering, screw you lid on a place the jar in the fridge until the next day. Once you are ready to eat, you can either shake up the jar, or if it's really full, mix it up with a fork. These spring rolls are sweet, tangy, spicy, fresh and super filling. It has tons of fresh ingredients like avocados, cilantro and my personal favorite, mangoes! The mangoes add an awesome sweetness to balance out the savory chicken and dipping sauce. This recipe will make about 8 spring rolls. 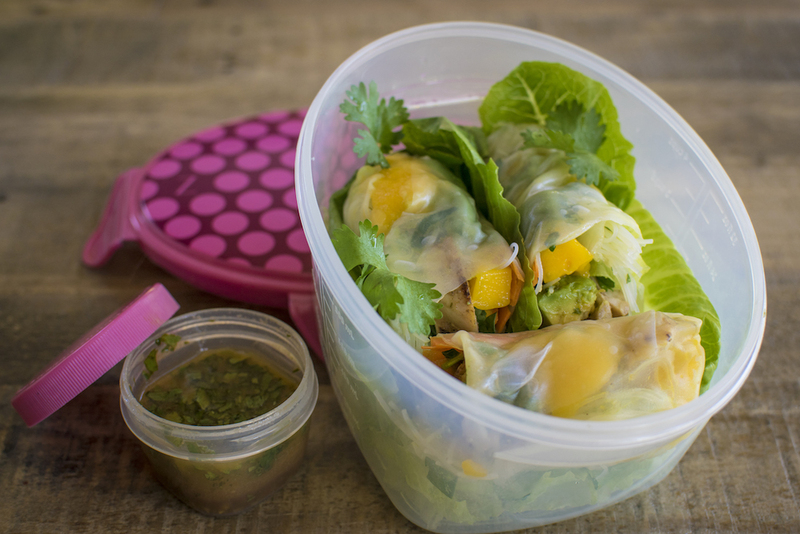 If you make the Cilantro Mango Chicken & Avocado Salad for dinner, just make extra, and grab some rice paper wrappers to make these for lunch the next day.